A new book from Susan Crockford and published by GWPF looks interesting. It’s called The Polar Bear Catastophe That Never Happened but maybe it could have been called “How to hide 30,000 Polar Bears” which the Green-Scare Machine has apparently done under a mountain of smear and indignation. This is a story of the concealment and the backlash — the failure of science. Polar bear numbers have grown four-fold during the last fifty years (obviously climate change has been good for them). But WWF is still running stories headlined: Polar bear population decline a wake up call for climate change action. The issue of polar bears is a bit esoteric for Australians, though we are still accosted by their posters, but it’s not so esoteric for people in little towns of Canada like Labrador where a bear was roaming the streets a couple of weeks ago. At least they weren’t invaded by 52 polar bears like the Russian town Belushaya Guba was. Those fat healthy bears stayed for two months or so and even wandered into buildings. Since a full grown male can weight 700kg and is the largest carnivorous mammal on land, that sounds like a Bruce Willis movie plot. Though polar bears in Russia are protected “because they are endangered” (though from what, I can’t tell you). If Bruce shot one he’d be breaking the law. The invasion of bears was of course, also blamed on “climate change”. The US site earns me a few affiliate dollars for the Paperback copy and the Kindle Copy. The Australian Amazon kindle copy is here. The Polar Bear Catastrophe That Never Happened explains why the catastrophic decline in polar bear numbers we were promised in 2007 failed to materialize. It’s the story of how and why the polar bear came to be considered ‘Threatened’ with extinction, and tracks its rise and fall as an icon of the global warming movement. The book also tells the story of Crockford’s role in bringing that failure to public attention and the backlash against her that ensued – and why, among all others who have attempted to do so previously, she was uniquely positioned to do so. In general, this is a cautionary tale of scientific hubris and of scientific failure, of researchers staking their careers on untested computer simulations and later obfuscating inconvenient facts. For the first time, you’ll see a frank and detailed account of attempts by scientists to conceal population growth as numbers rose from an historical low in the 1960s to the astonishing highs that surely must exist after almost 50 years of protection from overhunting. There is also a blunt account of what truly abundant populations of bears mean for the millions of people who live and work in areas of the Arctic inhabited by polar bears. Well ….they try to fool everyone , don’t they . And renewable energy is cheep and reliable ….. But everyone knows these polar bears aren’t real. 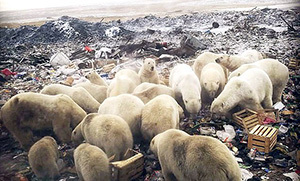 They are climate realists in polar bears suits trying to put a spanner in the works of rent-seeking climate troughers dedicated, poor but honest climate scientists who must save the human race from itself by legislating it back to the Stone Age. There used to be Polar Bears in Tasmania until the politicians handed over state forests to national parks and banned sustainable logging that the state forests were established to provide for the timber industry. But now without the logging carbon dioxide level has risen and driven the temperature up and the Polar Bears have disappeared. So I heard from the fairies at the bottom of a former Greens leader’s backyard. The polar bears also wiped out the Tassie Tiger and the Indigenous population…….. Well you gotta blame Whitey anyways. Polar bears are very sneaky…they hide up in trees, and…..
Perhaps late in pregnancy and during hot weather. In disguise! We gots fool the tourists! That’s how SJWs operate. They ignore the facts and focus on fiction. and lies. Too bad there are so many people who are either too gullible or don’t give a damn about the truth. That makes them SJW supporters instead of supporters of those few politicians who bother to speak the truth. We get the government we deserve. With forty thousand in strength, are not rare. I have spent many days fishing around the Mary River and Susan River Heads where the Port of Maryborough is located between the mainland and Fraser Island, and at many other locations in the Hervey Bay region, mostly with friends who live there and know their area very well. We have discussed the Saltwater Crocodiles and that they have been around for decades past but only in very small numbers. One described the launching of a small boat at the River Heads boat ramp as daylight was appearing and sighting a small Croc feeding on fish frames that had been left there. Another spoke about shooting a feral Pig and using part as Crab bait, leaving the carcass on a Termite mound to use later. Next day the carcass was gone and there was a track leading to the river and footprints, obviously a Croc. However, over many years of visiting and going fishing I never sighted one. These stories always emphasise climate change, but don’t talk much, if anything, about the fact that as crocodiles are now protected, their numbers have exploded. And as the numbers increase, the territory that each one can occupy reduces and therefore their habitat has to increase to accommodate the numbers. There have been sightings of crocodiles hundreds of kilometres inland as these lone crocodiles look for vacant waterholes. So the southern areas by defaull become attractive and no doubt the crocodiles will adapt. Do they also argue that the spread of cane toads is due to climate change? I checked the ice conditions around Novaya Zemlja, and there was plenty of ice on the east coast, but not so much on the west cost. It came back later and is gone now. ‘We’re battling ice conditions that we haven’t seen in 30 years,’ says Minister Steve Crocker. The new ferry in the Strait of Belle Isle doesn’t have the same horsepower as the old Apollo, so even with an ice breaker, it’s risky to travel in this year’s ice conditions, says the Canadian Coast Guard. Next year will be worse, not to mention conditions in 5/10 years time! Wow! What big possums those Russians have to contend with. But seriously, folks, wouldn’t Belushaya Guba be a perfect location for the next IPCC conference? Delegates could be housed in tents. Be a good alternative venue for the Davos pose fest too. If they can get the jets in of course. That’s it then, no need to fund any further climate change research as it’s now fully confirmed and past preventing. Better bring back coal fired power and enjoy life while we can. Did they miss the prediction that it will be all over within 12 years? A highly relevant post that leaves aside Global Warming for a moment to show the methods and cynicism used by activist political “influencers”. After all, counting Polar Bears is so much easier than unraveling the “science” of Global Warming but the two schemes have the common aim of controlling the political discussion and manipulating politics. If, as we have seen in this post, the Polar bear thing is a scam might not that give reason for doubt about Man Made Global Warming? Certainly there is No Science behind the CO2 Global Warming Scam and the public has a right to know directly from politicians the truth of the matter. Time for a Truth and reality check. The solution is simple. Assign each inner city greenie with their own personal polar bear. Bears wander into houses so should cope with indoor living and they would find food readily available. The only drawback is that we would soon have wailing and howling on the ABC about “Save the Greenies”. Well those poleys are in a plight now that they’ve eaten all the penguins and due to globull warming no longer have a reliable food source, lol. We could do that with illegals and their extended families. They told us that a changing climate would cause food shortages, and they were right! The Bears were threatened by computer models, but they ignored the threat and prospered. Too bad we can’t be that smart. one guest – Labor’s Mark Butler! The political battle over energy policy has escalated — the government says an independent analysis shows Labor’s climate policies would have a “devastating impact” on the economy. There are economic consequences from taking action to address global warming, but the bigger losses under Labor will depend on how it achieves its 45 per cent emissions reduction goal. Australia will endure economic costs from addressing global warming, but Brian Fisher’s economy-crushing carbon price assumptions appear to be extreme. Nevertheless, Labor’s more ambitious 45 per cent emissions reduction target by 2030 will cost Australia’s commodity-exporting economy more in terms of economic growth, jobs and incomes than the Coalition’s 26-28 per cent goal. The $73 to $263 per tonne shadow carbon prices he assumes for the Coalition – versus Labor’s peculiarly high $97 to $696 – are way out of kilter with analysis done by Australian National University economist Warwick McKibbin, Frontier Economics and RepuTex. The BAEconomics modelling, released on Tuesday, was leaked to the Australian and then used by the energy minister, Angus Taylor, to claim workers face a pay cut of $9,000 under Labor. Mark Butler plumbs new depths of ignorance whenever he speaks such that it’s hard to believe he is not Don Harwin’s twin. Oops.. Too late. That happened back in the 90′s. Love it! Not something you see everyday in the Aussie bush. Aren’t drop bears just drunk Koalas? Typical. Water covers this planet. On Antarctica it is 3-4 km high, a frozen ocean on a land as big as South America. Ice freezes at 0.0C by definition and in the far north brown bears have adapted to hunt on the ice. However with a summer average of exactly 0.0C in the Arctic, +/-0.1C can dramatically change the amount of ice, so it is used as a major scare tactic even though +/-0.1C means nothing. Polar bears, like most polar animals, are white and white is cute in a photograph. So they have been used as an icon of enviromentalism and the ice melt used to scare people that their cities will be underwater. No environment reporter points out that there is no land at the North Pole and melting sea ice cannot raise water levels. It’s not worth their job. No one cares that polar bears are uncute giant murdering bears and that they live on land every summer anyway, as do all the other mammals like seals and walruses who can see them coming, white on brown. No one publishes a photo of a cute white bear after lunching on a seal. So the very manipulative cute polar bear beat up has continued for 30 years despite the explosive quadrupling of polar bear populations. Still people dress up as threatened Polar bears. Perhaps they should take one of these three metre tall 3/4ton fierce carnivores home as a pet? Two problems would be solved in a Darwinian sense. Adopt a polar bear today. Someone would. Someone must have told you about arguing using absolutes. Because of such, almost all of your statements are false but I expect you knew that. There are plenty of images of bloodied bears feasting on dead animals and mentions of the difference between sea and land ice. Research suggests that glaciers behind ice shelves may accelerate by as much as five times following a rapid ice shelf retreat. that suggest that there are mechanisms by which reduced sea ice promotes loss of land ice. That’s rubbish, but I know you know that. Absolutely. well stated. Since you’ve given me that well researched response I will retract everything I wrote. You really exposed me with your wit and knowledge. And if global cooling has begun they may not accelerate. Wishful thinking is not empirical evidence. Someone must have told you about arguing using absolutes. Because of such, almost all of your statements are false but I expect you knew that. That is almost true by definition (Black Swan argument), but only if you choose to interpret TdeF in that way. I think he was making a more general argument so you are setting up a straw man there. Two words stand out there; MAY and SUGGEST. Sounds to me more like scientific speculation rather than fact! In his dotage is being so childish. I believe Attenborough’s been threatened and bought or just threatened by the BBC, his entire career washed into the sewer if he dare grow a brain and speak the truth. He seriously can’t be that uneducated to believe the AGW he spouts. But that’s like Nat Geo and all other doco channels these days. They probably get paid thousands by the Green Blob every time they add “..but in the face of a changing climate..” to their narration. Polar bear numbers are healthy today because of international cooperation that arrested a centuries long decline in their numbers due to hunting. Though at the moment polar bears in Russia are protected “because they are endangered” (though from what, I can’t tell you). So Jo your question is easily answered and you could have spent 5 minutes research to inform your readers rather than making a pithy comment. The soviet union was one of the countries that put protections in place to limit hunting. They were being endangered directly by people with guns and these measures remain in place. BTW, scientists gathered the data way back in the 1960s that was used to put the case for the international agreement. The fact that we now have healthy populations covering a vast region of the world is because science and international cooperation succeeded not failed. So you’re saying that hunting killed off bears? Isn’t this a direct contradiction that global warming is killing them? Jo’s point is that Man Made Global Warming induced by human origin CO2 didn’t do it. Bears thrive when they aren’t shot; what a surprise. I’m not misdirecting at all. I’m commenting on an aspect of the OP which I directly quoted, and then you’ve replied to me with no content that relates to what I wrote. So on the topic of the last 10 years which you have directed me to comment on. The population has remained more or less stable with some interesting behavioural changes where bears meet humans – partly to do with human numbers and also the fact that bears are demongraphically different from around 20 years ago due to their population increase. The idea that they are obligate sheet ice users is probably overstating their reliance on ice and they seem to be surviving the recent minimas better than some people expected. I’d have liked to see Jo either review the actual book rather than its blurb, or pull out some of the scientific publications that the book is critiquing. and yes, up until 1970 or so hunting was demonstrably causing population decline. Maybe you can save me some typing and look this up yourself. As many as 5,000 polar bears are feared to have been killed by hunters in recent years. that is a concern. The illegal wildlife trade is awful. I’m not including ivory in this but relaxation of laws permitting legal trade can greatly reduce illicit trade. There is no shortage of either white or black cockatoos. If a humane trade was allowed there would be little incentive to smugglers. There is no illegal trade in budgies anymore. And where were you when the decline was explained by “climate change”? I actually don’t get what you mean? Not surprising. Maybe you should plead the “5th” as a prophylactic? I haven’t been around for awhile — did Gee aye get replaced by CAGW ‘pod person”? So, could we say that numbers increased because of less hunting, but the numbers would have increased ever so much more if it wasn’t for global warming? The evidence for or against that is poor. You should always use a cushion when sitting on the fence. not knowing something is not fence sitting. You choose one side and I’ll choose the other. That should be fun. But you ALWAYS choose the LOSING side, little geegee. Its inbuilt into your persona. Well polar bears have definitely become extinct in Singapore. It must be the Global Warming and associated sea level rise and acidification that caused the remaining polar bear to die late last year – not that he was 27 years old which is 2 years beyond the typical life span of polar bears in the tropics (and well their native lifespan of 15 – 18 years). Once upon a time, high temps were indicative of climate change but, because we continued to have cold spells, low temps were quickly nominated as evidence too. The same goes for drought – and floods, more wind – and less wind, more storms – and less storms. In the Club’s statement below, they state “We know the facts. We have the solutions. We just need the political will.” The purpose of Green New Deal movement is specifically to develop the “political will” to implement their “solutions”. perfect followup to Wood’s Club of Rome quote re “political will”! Rep. Alexandria Ocasio-Cortez was quietly dropped as co-manager of a political action committee last week, just days after campaign finance experts questioned whether her role with the outside group was legal. Justice Democrats, a federal PAC that helped Ocasio-Cortez get elected to Congress last year, quietly filed corporate paperwork removing Ocasio-Cortez as one of the group’s “governors” in Washington, D.C., on Mar. 15, the Daily Caller reported on Monday. The move came just days after campaign finance lawyers told the Daily Caller that Ocasio-Cortez’s position as a governor of Justice Democrats could be a legal conflict because the PAC also supported her congressional bid. “If the facts as alleged are true, and a candidate had control over a PAC that was working to get that candidate elected, then that candidate is potentially in very big trouble and may have engaged in multiple violations of federal campaign finance law, including receiving excessive contributions,” former Republican FEC Commissioner Hans von Spakovsky told the outlet. Ocasio-Cortez’s chief of staff Saikat Chakrabarti, who founded the Justice Democrats PAC, was also removed as a governor on Mar. 15, according to the records filed with the D.C. Department of Consumer and Regulatory Affairs. Current governors now include Justice Democrats Director Alexandra Rojas, Nasim Thompson, and Demond Drummer. Attorneys for Ocasio-Cortez told Snopes.com in March that the congresswoman left the Justice Democrats board in June 2018. However, the group’s corporate filings indicate that Ocasio-Cortez remained part of its corporate leadership until last Friday. Ocasio-Cortez’s spokesman, Corbin Trent, did not respond to request for comment. A representative for Justice Democrats did not respond to request for comment. Ocasio-Cortez and Chakrabarti have been facing scrutiny for their involvement with the Justice Democrats and an associated PAC called Brand New Congress. The groups, which were founded by Chakrabarti, funneled over $1 million into companies controlled by Chakrabarti between 2016 and 2017, the Washington Examiner first reported earlier this month. The National Legal and Policy Center, a government watchdog group, filed a complaint with the Federal Election Commission requesting an investigation into the unusual arrangement. CAP was founded by ***John Podesta, a prominent member and operative of the Trilateral Commission. Podesta was the principal architect for the U.S. environmental policy for well over 2 decades. He served as Bill Clinton’s Chief of Staff, Special Counselor to Barack Obama and Hillary Clinton’s 2016 Campaign Manager. In July 2002, the UN Secretary-General appointed him to the High-Level Panel On Post-2015 Development Agenda that created the text for the Paris Climate Agreement in 2015. Note: tip of the hat to Dr. Willie Soon for forwarding this story to me, as originally highlighted in an email by Joseph Bast of The Heartland Institute. This quote is from Patrick Wood’s latest book . . . . . Haunting foreshadowing there Joseph. Booming buzzing confusion about describes the mass media today. OT but worth watching Ian Plimer on the Bolt report , he takes a stick to the 97% consensus. Repeat program on channel 83 sky news at 2pm. They aren’t polar bears, they are grizzlies. Climate change has faded their fur. Or likely the same Global warming induced “bleaching”. as reported on the GB Reef ! I guess if you can lose track of 1.5 Million Adelie Penguins , whats a few Polar Bears here and there? just loose change in the currency of climate alarm hyperbole. Plus the loss of 250,000 caribou in Canada. A lot bigger than penguins. Found in the next valley as the Inuit said. Losing might be seen as unfortunate. Losing 250,000 is an indictment on ecologists who reached for mythical Climate Change. Sorry about the red thumb. Caused by a green thumb. 250,000 caribou in Canada alone? Maybe more uncounted? Wow. That means we have to be rid of ‘em all ‘coz climate and methane an’ fartin’ an’.. I don’t dare expand that to every herbivore on the planet except cows, which don’t look so bad now. They so cute! Australia has millions of kangaroos plus buffalo plus about 1 million feral camels. Amazing really. Apparently they are the problem and the trillions of cellulose digesting, methane emitting termites are far worse. All have to go. No one believes that the world once had dinosaurs which were really bad for the climate and lasted 150,000,000,000 years but a single meteor ended the discussion. Now the Greens are going to keep the world static in CO2, Rainfall, temperature, species, unchanged, a sort of Mary Poppins world. Good luck with that. I spose that with the demise of the spaghetti weevil there will be no more hollow spag. Bummer! •A new book claims the number of polar bears may have quadrupled in the last 50 years despite melting Arctic sea ice. •Scientists predicted massive polar bear population declines as sea ice retreated, but that hasn’t happened, the book says. •“It’s a wonderful conservation success story,” said zoologist and author Susan Crockford. A little seabird has survived being blown hundreds of kilometres into the middle of Cape York in Far North Queensland after Tropical Cyclone Trevor carried the bird from its natural coastal habitat. The Jackson family from Wolverton Station, west of ***Lockhart River, discovered the injured ***SOOTY TERN on the cattle station’s airstrip. Sooty terns are a seabird normally found nesting on sandy islands on the Great Barrier Reef. Lynette Ensor from BirdLife Australia said it was “extremely unusual” for a sooty tern to be found inland. “It is very surprising because they spend their entire life at sea, except for when they breed,” Ms Ensor said. WISCONSIN, USA: Furthermore, in October of 2018, the UN Intergovernmental Panel on Climate Change released a report claiming that we have only 12 years to keep global temperatures to about 1.5C — if there is even a half a degree increase, it would likely exacerbate floods, droughts, extreme heat, and poverty, all of which will affect millions of people all around the world. The Paris Agreement, in theory, would prevent this from happening. For example, when the responders were asked if global warming will have deleterious effects in their own lifetime, the results were split. 34% answered they did indeed believe that there will be a global-warming-induced impact in their own lifetime; about the same percentage answered the opposite, with 7 percent claiming that global warming was a “hoax” outright. Additionally, 32 percent seemed to be more ambivalent about the issue, answering “kind of,” pointing to an acknowledgment of a fundamental lack of awareness. These trends demonstrate that large changes in public opinion are occurring among Americans across the political spectrum. A growing majority of Americans think that global warming is happening, understand it is human-caused, and are worried about its impacts—beliefs that are consistent with the findings of the 2018 National Climate Assessment, which found that climate change is already causing harm to communities in every region of the United States. 11th Hour Project, the Endeavor Foundation, the Energy Foundation, the TomKat Foundation, the Grantham Foundation, and the MacArthur Foundation. My bet is that the number is insignificantly different from about -100,000. In other words, no one does that and furthermore, they don’t even know that someone should take measurements and keep records. And that’s not a put down it’s just a statement of fact. When I went through school I was taught nothing about science at all until college and even then it was nothing compared to what I’ve learned from this and a few other blogs. Now if you’re someone who stands to gain from there being a danger from “carbon” it’s a different matter. Those people know what’s going on and they know it’s all hot air from the mouths of prevaricators like themselves. But they must keep the fear quotient as high as possible and they do just that. My county supervisor, someone who could get my vote every time because she’s honest and doing a good job, has jumped on that climate change band wagon. I have no idea how I can change her mind but I’m tempted to try. One of the things I discovered from Virginia Poter, head of environment Canada at the time is that a large number of bears regularly swims back and forth across The North Atlantic. So this isn’t even a surprise to me. That something could drown a natural born swimmer is ludicrous at face value. All it took was a politely worded message to the right place and the patience to wait for an answer and I had more useful information than the climate change pushers. During the Little Ice Age they went ashore in Scotland (as did some Eskimos**). Earlier one ‘lucky’ animal got a free ride when the inhabitants of Greenland sent him as payment for a Bishop (I wonder what the present exchange rate is?). The use of Inuit by the politically correct upsets the other tribes who object to be labelled as such. Polar bears’ hair is hollow. The entrapped air is both an insulation and a flotation aid. The Zimbabwean government said around 100 people had died in that country but the toll could be triple that figure. In 2000, Mozambique was hit by severe flooding caused by weeks of heavy rain, a disaster made much worse when a cyclone (Eline) hit. Maputo – At least 115 people were killed in Mozambique, Malawi and South Africa after heavy rains affected 843 000 people across southeast Africa, officials and the UN said, prompting calls for emergency aid. Mozambique is prone to extreme weather events. Floods in 2000 claimed at least 800 lives while more than 100 were killed in 2015. Ya know what? I haven’t watched the news or free to air TV for 3 years and as far as I’m concerned everything over that time just didn’t happen. Seems there’s nothing sacred and nothing that can’t be blamed on climate change . ” fighting against climate change is the equivalent of fighting against hatred. ” So now the muslim communities are the good guys? Try selling that around the world, places like Nigeria and Thailand and Kashmir and Chechnya and Serbia. The list is endless. Sectarian violence is just that. Making out it is a m*slim battle against white climate change is awfully perverse. It is a sign of the problem that I can type Taoist, Presbyterian, Jewish, Buddist, Confucian, Methodist, Lutheran, Mormon, Scientology, Catholic, Greek Orthodox and a thousand others without moderation. But I cannot type m*slim. If Big Bro UN Trilateralist Kommisars, et big Al, have their way, soon you wont’d be able to THINK it let alone type it. H/t Ingsoc. They should make up their minds: Is it Trump or Climate change? I thought they were still blaming Abbott. what…more than is happening already? Writing in the new issue of Radio Times magazine, Giles said: “I am calling on the BBC and the other major broadcasters to incorporate an additional five- to ten-minute slot into the forecast that focuses properly and honestly on the Earth’s changing climate. Giles added that “understanding and explaining climate change is one of the most important things facing humanity today” and said that his proposed new segments should discuss the possible impact of climate change around the world, including on animal migrations and “the increase in intensity of Atlantic hurricanes”. Giles, who led the BBC weather team for 17 years until his retirement in 2000, says the public is largely misinformed about climate change and regular broadcasts would rectify this. ‘Where the sceptics go wrong is that they confuse weather and climate,’ he said. ‘Of course you can have a very cold spell in the winter in the UK, as we did last year, by being visited by the so-called Beast of the East. But that’s weather, not climate. Climate is long term – decades and centuries. Giles said that he would be willing to step out of retirement to help the cause, adding: ‘As was clear to me back in the 1980s when I first started talking and writing about the effects of climate change, the facts are stark. I would love to read that explanation because I cannot understand what he is talking about. What Climate Change? What Global Warming? What rapid rise in sea level? What increase in storms? So go on, tell us about Climate Change, now that Global Warming is dead. The fresh and jazzy new BBC Scotland “Nine” news programme has come under a wave of criticism after inviting a ***renowned climate science denier onto its show on the very day of the global school strike. The Nine’s decision is directly in contravention of the BBC’s own policies. Last year the BBC was forced to introduce new guidelines after repeated criticism over the past decade for enabling “false balance” on the topic of climate change, as well as for failing to fully implement the recommendations of the BBC Trust’s 2011 review into the “impartiality and accuracy of the BBC’s coverage of science”. AUDIO: 48min38sec: 19 Mar: ABC Nightlife: How will climate change affect your insurance premiums? Principal at Finity Consulting Tim Andrews and Climate Risk’s Director of Science and Systems Karl Mallon join Nightlife to take a look at the future of insurance and how they’re adapting to climate change. Prime Minister Scott Morrison is using ***hotly disputed forecasts of economic pain to try and flush out the missing pieces of Labor’s climate change policy. An economic modeller has suggested the Opposition’s target to cut carbon emissions could wipe billions of dollars out of the farming, mining, electricity and transport industries. Former deputy prime minister John Anderson, in an extended interview with the ABC, said neither side of politics had been completely honest about the true economic cost of their climate change policies. Australia’s former chief agricultural economist Brian Fisher said the Coalition’s policy would cut wages 2 per cent, while average wages would fall 8 per cent, or $9,000 a year, under Labor’s plans. Labor’s climate change spokesman Mark Butler said Dr Fisher’s analysis was “utterly dodgy rubbish”, noting that his report assumed renewable energy was as high as $200/MWh when Snowy Hydro was already offering contracts at $70/MWh. “We’ve seen these fear campaigns claiming Whyalla would be wiped off the map, and lamb roasts will cost $100. Now we have this prediction of doom and gloom. They simply aren’t credible,” Mr Butler said. The Australia Institute research director Rod Campbell dismissed the modelling, which he said was based on flawed assumptions. “It’s economic modelling like this that are giving economists a bad name,” he said. Australian company directors nominate climate change as the number one issue they want the government to address in the long-term, in a survey of more than 1,200 business leaders. Some days there are signs that there is light at the end of the tunnel. Other days I conclude sense is a long way off. I fear Australians, as a collective, will spend more than a trillion dollars on intermittents before the futility of the effort strikes. NSW to become a weaker, poorer version of SA sooner than I expected. Arrears would need to double from current value to cause serious problems for the banks but that could happen quite quickly as interest only loans turn to principal plus interest. Now, more than ever, I understand the wisdom of the saying: “We get the government we deserve”. In Qld, labor put us $80 bill into debt and but for a brief dalliance with a Newman government, we vote them back. NSW is, I believe, in surplus and the ungrateful sods are about to hand power to the wreckers. The socialists are winning. The young blame us boomers for everything they don’t like, but they will not be able to blame us for what is about to befall them. It will be of their own making. They will still blame the Boomers as they will say its all down to the mess they were handed. You know things like a once working power grid, sewerage, water, the Internet and all that trivial first world stuff. Never mind a hashtag campaign and a candlelight vigil or two will fix it. ***that cold weather gets them believing in manmade gobal warming every time. “Churchill is recovering from economic strife following no train service for over a year and a half. Now with the connection to the south restored, a bright future is in store for Churchill and the surrounding communities. But you do get a cuddly toy! I am Swedish and live in Sweden. I have few websites I visit daily. Joannenova is one of my favorite sites. Greatings from Stockholm. Spring is it on its way here. The Left never updates their talking points – which makes it easier to call them on their lies. I don’t know if it’s willful or they’re just that dumb.